INDIANAPOLIS (February 10, 2014) — Klipsch, a leading global speaker and headphone manufacturer, today announces the launch of the Compact Performance Series speakers. As an all-new product series, the Compact Performance line delivers four new high-design speaker models (CP-6, CP-4, CP-6T and CP-4T) made for both the residential and commercial audio markets. All four models combine clean lines and a smaller size to compliment any décor. A unique integrated mounting bracket provides close-to-the-wall placement while a V-shaped cabinet rear profile allows the speakers to tuck tightly into a corner for a seamless look with maximum bass output. Each model is available in a paintable black or white finish with matching grilles and offers a weather-resistant, reinforced cabinet. In addition, the speakers are equipped with dual ¼-inch, 20-thread inserts on the cabinet back for versatility in using optional third-party brackets or for using safety cables in commercial applications. 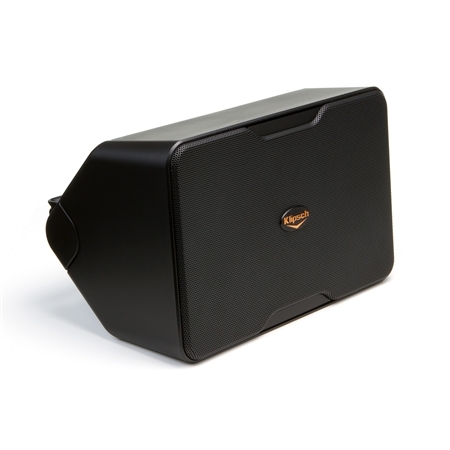 Klipsch’s proprietary Tractrix® Horn technology provides unrivaled low-distortion clarity and detail while long-throw woofers produce powerful low frequency response. Because of Klipsch’s expertise in efficient speaker design, the Compact Performance Series speakers are able to provide maximum output with minimum wattage. The CP-4 and CP-6 residential models not only provide robust outdoor sound but can also function perfectly indoors as surrounds or bookshelf models, with or without their brackets. They retail for $249.99 and $349.99 per pair (U.S. MSRP) respectively. Whether on one’s feet or on a ladder, installation of all models is quick and easy with a clean finished look due to both front speaker wire terminals and front access bracket connections, all enabling a one-screwdriver installation. Brackets can be adjusted 45 degrees in either direction without additional tools. Ideal for commercial installation, the CP-4T and CP-6T are versatile 70/100 Volt distributed audio solutions with design and sound clarity suitable for any business application. Combining high sensitivity with four tap settings, the CP-6T is the perfect choice for numerous commercial applications of varying sizes. Its 8 ohm bypass allows quick adaptability for venues that specify separate 70/100 Volt and low impedance zones in the same system. The CP-4T’s high efficiency provides sound reproduction at even foreground music levels with its single 5-watt tap setting. The CP-4T sells for $300 per pair and the CP-6T for $430 per pair (U.S. MSRP). All Klipsch Compact Performance Series speakers are sold in pairs and are now available through authorized dealers. For more information on the Klipsch brand and its product offering, visit Klipsch.com.